1. Start with a clear plot screen. Draw a circle: the location of its center and size is up to you. 2. Press (Cmds), 3 for Line, 6 for Tangent. 3. Select a point on the circle and press [ Enter ]. The point is designated as object GD. 4. If you wish, display the coordinates of GD. See Part 3 as a refresher. 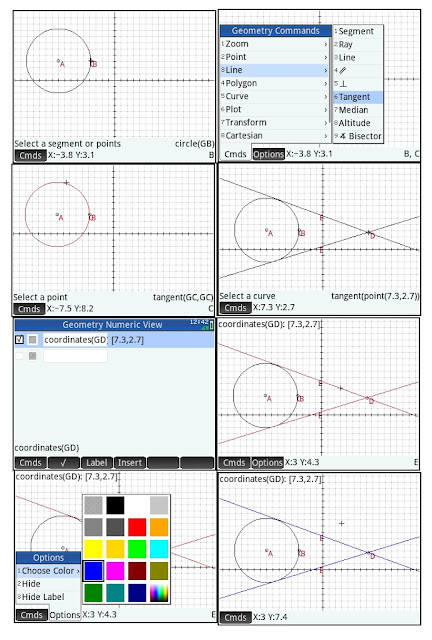 Per HP Prime’s help: The tangent command draws one or more tangent lines through a specified point to the circle and the line segment connecting it to the radius. 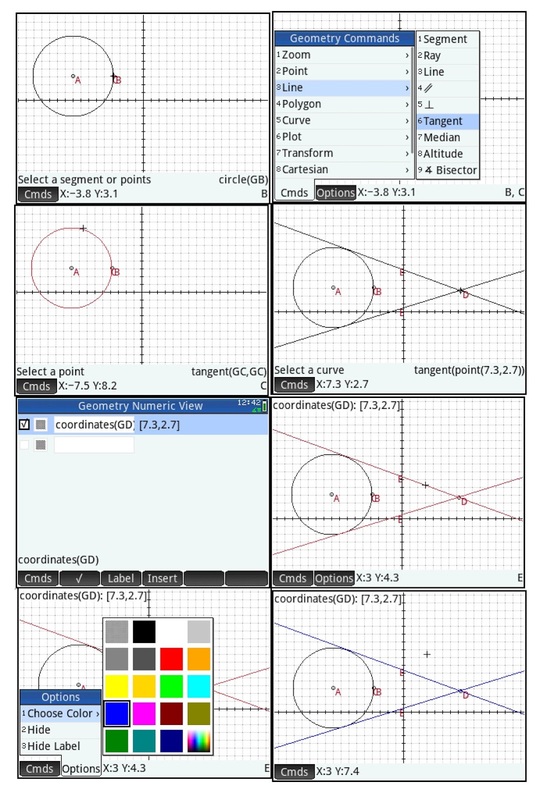 The following steps is how to color tangent lines. By default, geometric objects are colored black. Adopt this procedure for any geometric object you want to designate as a specific color. 1. Move to the tangent lines so that they turn red. The (Optns) soft menu appears. It is key that the (Optns) menu is available. 2. Press (Optns), 1 for Choose Color, choose any color you want. If the pictures, I have selected blue. In order to see the different color, move the cursor away from the tangent lines. What does Part 5 mean? It’s time to plot some functions! That is next time.